During the week, I sell croissants and coffees to busy commuters. But on Wednesday, it's my volunteering day at the Museum. And it is such a delight to come volunteering! It brings meaning to my daily life, for curating beetles feels such an important aid for biodiversity research and protection. Wednesdays at the Entomology Department are also fulfilling and entertaining, as it is slowly revealing secrets from the past and from abroad. As the week goes by, the less I think about cafè latte, the more I think about beetles. There is something special about coming to Origins, where the Entomology Department is located in the Museum. First I get to the Earth Sciences gallery, with this immense globe and its mysterious music coming out of it. Have I landed somewhere unknown to humanity? Then I pass through the Bird Section, which I imagine comes alive at night and becomes this wonderful exotic hen house. Then Dippy and Charles Darwin are here to remind me about the great legacy of the works of thousands scientists battling elements and society in the name of science. Then I slip through the doors of Origins and the smell of these cabinets full of beetles brings me back to 2012. 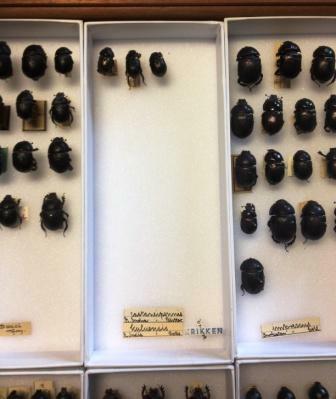 My first project in the Coleoptera Section was to convert the collection of Deltochilum (Scarab beetles) into new unit trays, create labels and update the electronic collection. It was a brilliant way into the collection, caring for these jewels of Coleoptera. I can't help but fall in love with the brightest, most colourful ones! Like the species that shows variants of metallic colours in different specimens. It was also challenging due to verdigris and broken pins. These specimens are very fragile by nature, so when verdigris starts destroying the inside of the beetles, handling the whole lot becomes like eating a fresh almond croissant: it breaks into a thousand pieces before you can do anything with it. Lucky was I to have some emergency help from Max and Beulah! Curating beetles requires a specialist kit, which I learnt to use throughout my various projects at Origins. Two types of handling tools are used: the pinning forceps and the fine forceps for specimens. Pins come in various sizes, which is useful when replacing a pin. A pinning block is rather fascinating: you can pin labels at the exact level needed, depending on the number of labels linked to one beetle. A delightful thought for a volunteer stubborn and slightly on the side of perfectionism! An organic glue is good when it comes to sticking parts together to form one specimen, because if I get it wrong it can be easily removed. A pen with archive ink is necessary for writing labels that should last for few centuries. Gelatine capsules collect parts that can't be mounted back to their original bodies. Maybe a lucky entomologist will find in there the missing part of his specimen. 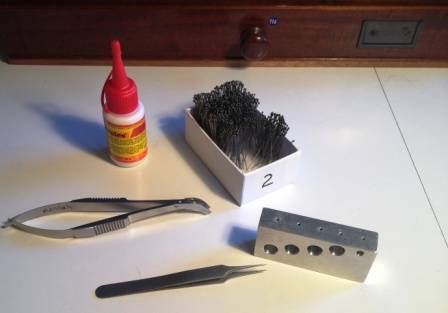 Tools: Size two pins, springform forceps, watchmakers forceps, pinning stage and glue! I helped Max Barclay to prepare some specimens to send overseas for loans. I first found it dangerous to mail brittle little things to Spain or Japan. I soon discovered that the Museum has specific procedures to keep the package safe. Other countries are more relaxed in terms of secure parcels, which creates a sort of lottery for the state of the contents. There are also evidences of loans within the drawers of the collection, with labels describing the name of the borrower, the number of beetles and the date of loan. Max told me once about this man Krikken who in the 1970s borrowed some specimens but never returned them, making sure everyone knew by pinning his name on a pretty label. See my evil eyes? 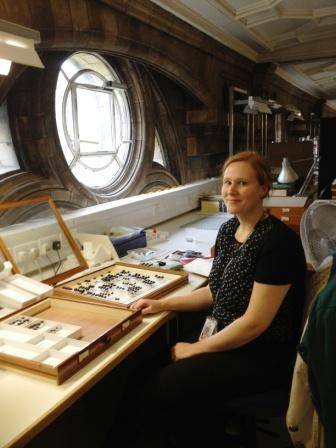 Opening drawers of the Coleoptera collection is like travelling in time and space. Some labels are handwritten in a fashion that dates several centuries ago. I can imagine Victorian times and explorers à la Livingstone. Other labels cite the location that no longer exists. A captivating lesson of geopolitics can be learnt from one drawer only. Sometimes it is useful to fiddle with German, French or Spanish to decrypt the location. And a bit of Latin vocabulary is always useful to understand and remember the scientific names of the Coleoptera.